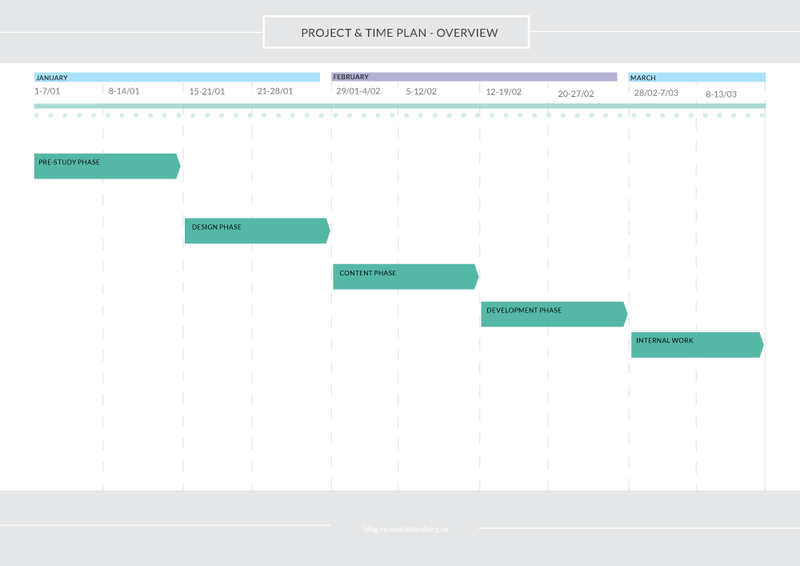 Every project plan need a clear, visual time plan. This helps both you, the team and client to better understand the project and helps everyone feel more in control since it makes it visually clear on what needs to be done, when and by whom. There are two types I primarily work with; overview and a detailed time plan. The overview is useful for creating roadmaps or in presentations, when you don’t need to go through every nitty gritty task in a project. You can also take it to a third level, and make it even more detailed. But I usually don’t – because I think that is a total waste of my time which I can put to better use. Thats because usually there are changes, unforseen things happen, so that level of detailed planning have never been required throughout my 10 plus years long career. (Other people may have another experience though, so I never say never!). With my detailed time plan you will be able to get a grip of what needs to be done by when, using this level of time plan, with actions – and quickly be able to update the time plan when and if needed without having to spend to much time making the updates. I think a time plan should include your company branding and be visually appealing. 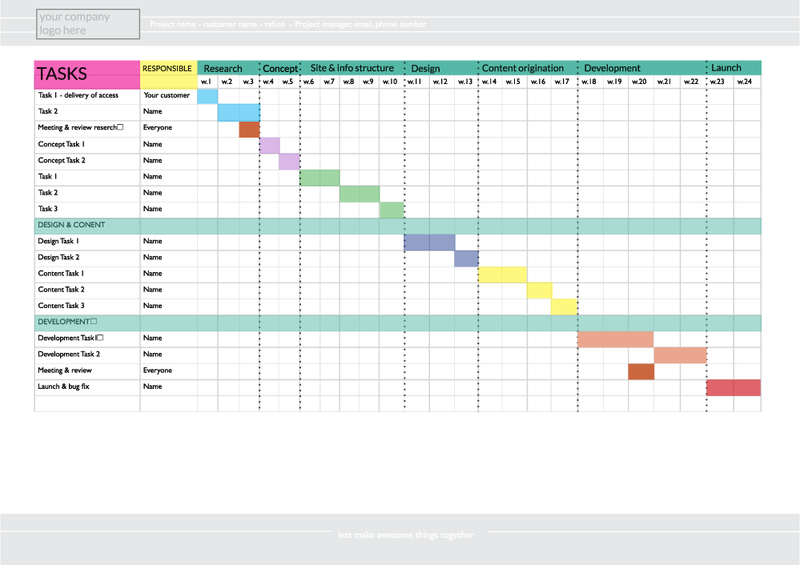 Especially if you work at a design agency, I really think you should make the effort to deliver time plans that don’t look like something that make syour eyes bleed in excel with bright Microsoft standard colours. This is a very simplified, scaled down time plan outlining the process and/or phases. Either it consist of just the different phases in relation to a timeline or you can add purpose and deliveries/outcomes as well in each box. Suitable for: a project proposal, quotation/agreement or a project presentation. This outlines each task and when they are due on a weekly basis/ per week. A timeline with weeks/dates and months, with any public holidays, team etc, greyed out and taken in account for. The software I usually use to create time plans is Excel, and then I save as PDF and distribute to both client and team. You can also use Adobe InDesign to make more professionally looking time plans. Just insert a table and create table styles which you assign to the cells to mark out the information. Excel is quicker, and you can probably insert custom colours to reflect your company brand, there is a page in the book Excel Annoyances that gives you clear instructions on how to achieve this.